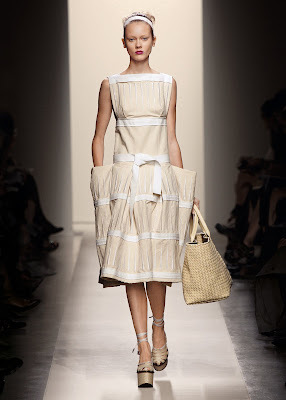 For spring 2010, Bottega Veneta presents a collection of focused simplicity and individuality. The palette is spare — expanses of white, ivory, canvas, and straw delineated by strokes of egg yolk yellow, Delft blue, orchid, and fever red. The occasional solid-color silhouette mirrors the painterly effect, brightly punctuating the clean span of the collection. Materials range from plain weave cotton canvas and cotton batiste to extraordinary blends of silk and viscose, silk and cotton, and silk and linen that gently outline the body. The silhouette is boxy, architectural, designed for maximum range of movement. Fabric is draped and wrapped, or cut asymmetrically to circle back upon itself, or constructed without seams to enable and enhance the body’s motion. Pleats and folding are structural as well as decorative, adding shape and functional features like pockets. Dresses, tunics, and pants predominate, the dresses and tunics nipped in with stitched cotton belts, the pants cut square and roomy in various lengths. There are one-piece coveralls, as straightforward as uniforms, and shirts of cotton canvas with the ease of a smock. The season’s shoes are inspired by the espadrilles and handcrafted of raffia, leather, patent leather, lizard, and other materials. Artisan techniques center on the simple strip, which is crossed, woven, wrapped, stitched, and tied. Soles are sometimes flat, thick, and wrapped with straw, other times they are organic shaped wedges sheathed in leather. Handbags are generously sized and either pale or brightly colored. There are top-handled bags of tissue-soft cloth leather, clutches of hand-painted goatskin, and a Cabat woven from straw-like strips of nappa leather. Constructed with new invisible aluminum hardware, the handbags are remarkably lightweight. The final element in the composition is jewelry, large, sculptural, and expressive, made from antique sterling silver with rock crystal, yellow jade, mother of pearl, white Kogolong, and natural horn. In the Philippines, Bottega Veneta is exclusively distributed by Stores Specialists, Inc. (SSI) and is located at Greenbelt 4, Ayala Center, Makati and Rustan’s Makati.